We have a feral cat who USED to come into the basement and get closed in at night. For a while, my husband insisted on leaving the basement door open slightly so that he could come and go as he pleased. After many, many arguments, I told him that allowing the door to remain open so HE could go in and out also meant any OTHER animals could go in and out. I had evidence of that because more than once, the food was all gone and the water dish was full of dirt so that I knew a raccoon had been inside. I told my husband that raccoons often carry rabies and that rabies are spread through their saliva…asking ME to clean up the dishes and feed the cat every day is dangerous, to say the least. The cat has been immunized against rabies but I haven’t. Finally, after many arguments about that and the wasted heat and air conditioning…eventually causing the air conditioner to leak all over his precious stuff…he listened because the repair man told him that the door CANNOT be left open. I told him that if the cat did not come in at night when he called him that he would HAVE to close the door and leave him outside. My thinking was that a few nights outside would likely convince him to come indoors. I was wrong…he moved onto the front porch and now, as far as I know, he only leaves there to go to the bathroom or if there is a delivery or they are grinding wood out in front of the house and the noise scares him. He is not afraid of me or my husband but he is terrified of other people. I relented and started feeding him on the porch. All was well until about a week ago when I noticed that all of the food was gone in the morning. First of all, I cannot AFFORD to feed the wildlife and secondly, I had no idea what I might be feeding. I knew there was a possum around and I didn’t mind throwing some scraps out for him because they eat ticks and throwing the scraps out the SIDE door meant I didn’t have to flush them or double bag them and throw them in the garbage. We used to have a compost heap but the yard is so torn up that I can’t get down there safely any more. The arrangement was working until these dishes started being emptied. I figured the possum was coming up on the porch and told my husband that I have to dramatically reduce the amount I am feeding the feral cat and bring the dishes inside after I feed him. 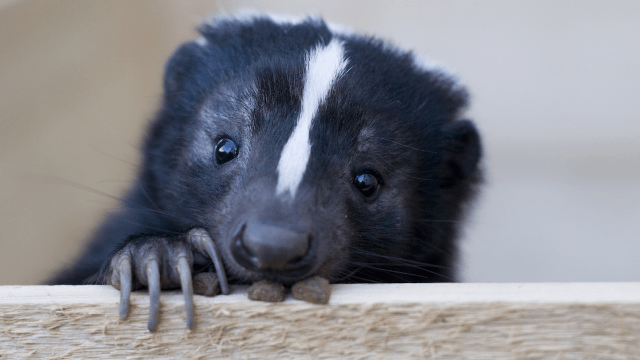 Last night, I was about to do just that when I heard a noise from the porch…I turned on the light and looked out the window and saw a skunk looking back at me. I didn’t SMELL him and I didn’t see the feral cat so I turned the light off and left…the dishes were, of course, empty this morning. I guess the cat knows enough to stay away from the skunk because he was nowhere to be seen when the skunk was here and he doesn’t smell this morning. I have nothing against skunks except their smell…I had two cats in the past who went in and out and who were NOT smart about skunks…I had to bathe them more than once and that smell got into the house because one of them went into my son’s room and went to sleep in there so the entire room and his bed smelled HORRIBLE. It was as if the skunk had been IN there. I had to wash everything and open the windows and it still took time to dissipate. It smelled like burning tires. Just thought you might enjoy MY happy evening and the little visitor on my porch. This isn’t really HIM or HER…I just picked this off the internet. Skunks just MIGHT smell worse than WE did but only a LITTLE. When I lived in LA the last two years, Hoggie could run free 24/7. We had a signal. I would clap my hands twice and he would come running in within 5-10 minutes. Sometimes I would call out "Hog Dog Dog Dog Dog-gie" on the night air. I am one of those weird people that likes skunks. No, I wouldn't feed them, but I do like watching them. When I have been outside at night in the past and a skunk would wander towards the yard, I would just quietly say hi. I would move slowly and get them used to the fact that I was there too and meant them no harm. I never have been sprayed, but am very familiar with the smell. Guess you and your feral will have to have a chat about the feeding schedule if he wants to continue to be fed..lol. There are people who will trap them and relocate them to a less populated place. We did that at a place I used to work when we had a Mother skunk and her babies in a nest close to the entrance to our office. Jennifer-Quit-05-01-14 How did you keep from getting sprayed? Or how did the trapper keep from getting sprayed? They are sort of cute and the look on his face probably mimicked the look on mine...FEAR. I just left him alone. jonescarp.aka.dale.Jan_2007 The cat USED to come easily into the basement but now he has claimed the front porch as being his....it has a roof over it so he is protected from the rain and he really thinks it is HIS place. This was years ago - and I never saw the skunk moving about. They set traps (no harm to the skunks) and then covered them some how to prevent getting sprayed. I believe the babies were to young to spray. Hope you have stock in tomato juice, lol. I feel your pain! I have seen that ad and laugh every time and then I remember being on our back deck of the old house (smoking of course). It was pitch dark out there and I reached down to pet the "cat" and he was jumping all over the place, I asked him what on EARTH was wrong with him and then I realized, it was a young raccoon. Hahahaha. Fun and games with wildlife! Enjoyed your story bunches! Giving you a little giggle. What a cute story. Cute photo from the internet, tooo cute. So sorry for your troubles with the wildlife. I hope you can come to a solution, although I don't have any suggestions. I have a lot of wildlife where I live. I do enjoy them from afar. All I can say is your a kind hearted and brave woman. May God bless you with a solution and may God bless you and yours. There is a neighborhood Pepe Le Pew here. He was getting into my yard, and my dog simply cannot resist the urge to give chase. You would think she would learn. Anyhow, thanks for reminding me. I have a noise maker I need to put in the yard because I got rid of Pepe earlier, but he has returned. I have a super shampoo for the dog, but she still needs about 2 more baths to completely get rid of the smell. I lived near the woods growing up and our dog roamed them freely. I cannot COUNT the number of times he came home after being sprayed. When we would drive on the winding country roads, the "fragrance" was often in the air. Good memories - except for the poor sprayed dog!!! We washed him in vinegar(?) water, if I remember correctly. Do they have special shampoos for it now? I have a special shampoo that is supposed to be for this, but it still takes probably 3 baths, which Lucy is not fond of taking. Marilyn.H.July.14.14. Glad I could be of service reminding people that it is apparently skunk season. The cat will be fed while it is still light outside and I will bring his dishes in before it gets dark. It will be quite a change for him. I have no idea if the skunk will stop coming around if there is nothing there. There is NO WAY I could bathe that feral cat...I WOULD need stitches..he can't be picked up. NewMe I didn't have any special shampoo, I just looked something up on the internet...used peroxide, white vinegar, baking soda, and a tsp of dish soap. I dunked the cat(s) in it and then I rinsed them by dunking them again. I expected to need stitches but neither of them fought me at all. It also worked with just one bath. They even forgave me. Thanks for the recipe. The dog still smells, so I might give this a try tomorrow. PS_ a very little-known factoid. I read this in Smithsonian magazine years ago. Apparantly, there is a very small segment of the population that is just a little bit different. When they smell skunk, they kind of like the odor. And the reason this fact stuck in my mind- I am one of the very small percentage of skunk lovers!!!! OK, I don't really love them. And up close and personal, the smell is a little bit bad. But from a distance, Pepe Le Pew sprays perfume! Weird, huh? Weird, YES! lol But each to their own. I certainly would rather enjoy the scent than not! NewMe I think freshly ground GOOD coffee kind of smells like a skunk...fortunately, it doesn't TASTE like that. Sootie I actually forgot that skunks can carry rabies, several years ago, I had to call animal control because a skunk was making an effort to get into the house...looking through the storm door, trying to pull it open. The crazy thing was that it was in daylight. I was worried that it was sick...animal control said the only thing they could do was to shoot it in my yard and that would release the smell. They agreed that its behavior was odd but they said "If it had rabies, it would be running into trees." I remember saying, "WHAT?" It went away after a few hours but it was very strange...so was the animal control guy. Oh my Ellen! You have SUCH an interesting life! Please, please - be careful! Strudel Interesting...ridiculous, maybe. My son just called to let me know that they are closing the kitchen at the cafe at 2:30 instead of 3:00 so people can watch the eclipse...they have ONE pair of glasses, LOL. I told him I had made a box...I have to work tomorrow but I was SUPPOSED to get off at noon, 1:00 at the LATEST. Not sure what I am going to do. I have to go remove the feral cat's dishes before it gets dark and I run into Stripes face to face. Guess that's better than the alternative of running into his OTHER end. Hahahaha...yeah, I pretty much name everything. The feral cat is a bit overweight and has particularly short legs and is NOT friendly to most strangers so I named him Pesci...after Joe Pesci. We had two other visiting cats...one with very blue eyes my daughter named DeNiro because he LOOKED tough...another with long "blonde" fur...she was "Marilyn." She used to sit on my lap and then one day, she was gone. I think DeNiro got really old. He was beautiful. Okay, enough is enough, I need to get off here. I have to get up early for work. Just be careful because skunks also can carry rabies! Given a choice, I'd rather have a racoon......that SKUNK SMELL can hang around for a long time especially in animal fur. Smells are one thing that just make me COMPLETELY CRAZY! I really enjoyed your story Ellen. When I was still smoking I was sitting out on the deck, and a skunk came right up to my foot. I sat very still, and it slowly walked away, I walked very slowly into the house. Then another time I was out there smoking, and it was dark, and out of the corner of my eye I saw something move coming up onto the deck, I reached down to stroke it and saw a huge racoon face staring up at me. I jumped, and he took off. Cutest face ever! He was a big fat one, lol. Christine13 Hahahaha, such incredible self control when the skunk came up to you, not sure I could have done that. Raccoons ARE adorable but they are not very sociable...even ones that have been raised in homes can turn in a second. My husband had one from when it was a baby and when it got older, it was seriously mean. It went off to live on its own. Skunks just have so much power over us...one spray and it's over...eeeewww.